Never leave your flying squirrel out of its cage unsupervised. It could escape or get hurt. Healthy squirrels are more likely to socialize with you. Flying squirrels weigh about 4 to 5 oz. and are about 1 foot long. Using skin flaps connected from their wrists to their bodies, they are able to glide from tree to tree, although they cannot actually fly. 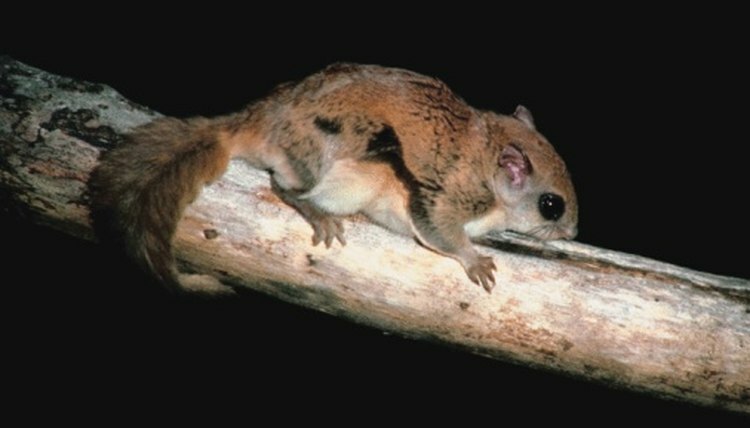 There are northern and southern flying squirrels, but their behaviors and trainability are the same. Flying squirrels are some of the easiest wild animals to tame as they are very social, curious creatures. In some states these pets are illegal without a permit. When rescuing a wild flying squirrel, bonding with it in order to gain its trust is important. Take your wild flying squirrel to a wildlife rescue or veterinarian immediately after rescuing it in order to cure any health problems. Call your state's local office of the U.S. Department of Fish and Wildlife to find out if keeping a flying squirrel as a pet is legal in your area. If you intend to release it back into the wild, inform the office. Some states do not allow wild squirrels as pets and some require a license in order to keep them legally. Provide your flying squirrel with room to glide and exercise by placing it into a tall, wire birdcage. Feed your wild flying squirrel a mix of pet rat or mouse food, protein such as cooked eggs as well as fresh fruits and vegetables. Handle your flying squirrel frequently. The more contact your squirrel has with you, the faster it will bond with you. Always handle your squirrel in a closed room to prevent it from escaping. Carry your flying squirrel around in a bonding pouch. A bonding pouch is a pouch worn around your neck that hangs near your heart. Your squirrel will learn your scent and get used to you, as well as bond with you because of your body heat. Encourage your flying squirrel to ride in your sleeves or climb under your shirt to bond with your scent and familiarize itself with you. Reward your flying squirrel for interacting with you by feeding it snacks such as small nuts after putting it back into its cage.